Herman and Augusta Rice photograph, ca. 1880s, New York, New York; digital image 2014, privately held by Melanie Frick, 2014. 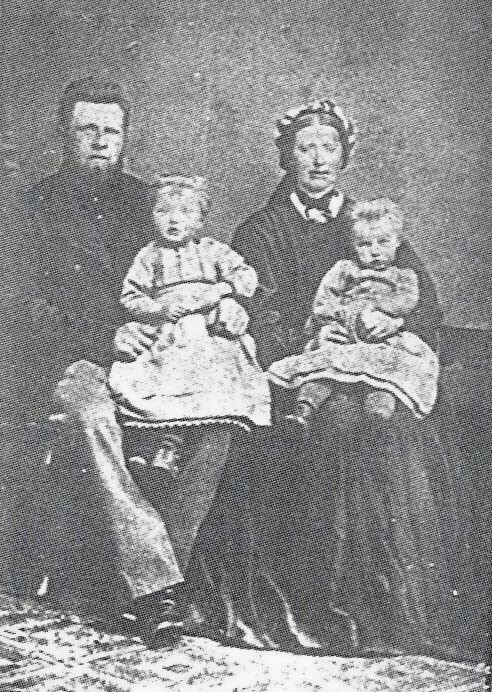 Herman and Augusta Rice appear dressed in fine Victorian fashion and stand next to pillars to emphasize their short stature. Augusta’s hairstyle is particularly striking; a flat bow adorns the top of her head, and small curls are arranged across her forehead in such a way that it almost seems as though they could be part of a hairpiece. The bow and flattened style of her bangs were fashionable in the late 1870s.4 She wears a carefully fitted gown with a train and no shortage of flounces, ruffles, and lace trim. With a locket or pendant necklace and a bracelet setting off her ensemble, Augusta appears to be dressed very well indeed. Herman looks equally sharp in a formal fitted dinner jacket with a pocket watch and freshly shined shoes. Herman and Augusta Rice, an alleged brother-sister pair, appeared at Harris’ Mammoth Museum in Cincinnati in 1883,9 were affiliated with Keith and Batcheller’s Mammoth Museum in Boston in 1884,10 and were showcased as curiosities at Forepaugh’s Dime Museum in Philadelphia in 1885.11 They had toured with P. T. Barnum in 1877, at which time they, along with a third sibling, Johanna, used the more Germanic surname Reis.12 One wonders, however, whether these names were merely a part of their identities as performers. Who were they, and what became of them when their dime show days were over? This entry was posted in Photograph Analysis and tagged 1870s, 1880s, antique photograph, carte de visite, circus, New York, Reis, Rice, sideshow, vintage photograph on August 8, 2014 by Melanie Frick.